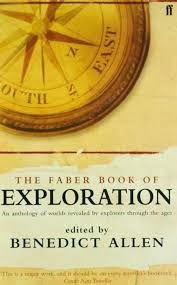 I'm reading the Faber Book of Exploration, edited by Benedict Allen. It's an 832-page tome of a book, no illustrations and very dense (Allen's commentary is in 8pt in two columns)... but it's compulsive reading. Allen is the perfect companion. I've only seen one of his travel programmes - the one across Mongolia in the late 90s, in which he dispenses with crew, doubling up as both narrator and cameraman (possibly the first to do so?) - and he clearly knows his stuff. I like the way he's divided it up into themes: sea, hot deserts, cold deserts, forests, mountains etc and then chronologically within those themes. He does a good job of redressing some imbalances: the inclusion of many women travel-writers for example. And he has a go at including indigenous writers who, having been on the receiving end of western explorers, went to where they came from (eg a native American Indian's account of a train ride east to Chicago, where 'the people swarm like ants'), though I yearned for more. Much of the book deals, of course, with that curious breed of Victorian & Edwardian male who 'explored for England', driven by (at first) the opportunities of trade, then the white man's burden of civilising & converting heathens, and then scientific discovery or simply personal wanderlust. But thankfully there are plenty of non-Brits, especially into the 20th Century. Do I have a favourite? Possibly the Norwegian Fridtjof Nansen who led the first crossing of Greenland in 1888 and almost reached the North Pole in 1893. Everyone's heard of the "Dr Livingstone, I presume?" 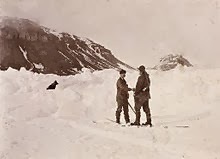 quote when H M Stanley bumped into the Scottish explorer in the middle of Africa, but few are aware of the equally incredible encounter between Nansen and another British explorer, Frederick Jackson, in the middle of the Arctic. Nansen had been marooned on an isolated island after his North Pole quest and looked unrecognisable covered in walrus grease with three-year beard and disintegrating clothes. Amazingly, Jackson chanced upon him, and after an awkward hesitation, said: "You're Nansen aren't you?"